According to MarketingLand, nearly three-quarters of surveyed US and UK companies claimed to bring in 20% of their annual revenue between Thanksgiving and Christmas. The National Retail Federation reported holiday sales in 2015 increased 3% to $626.1 billion. The second-highest-grossing holiday — Back to School — brings in a tenth of that. Combine all other retail holidays. They still bring in only a quarter of winter holiday sales. 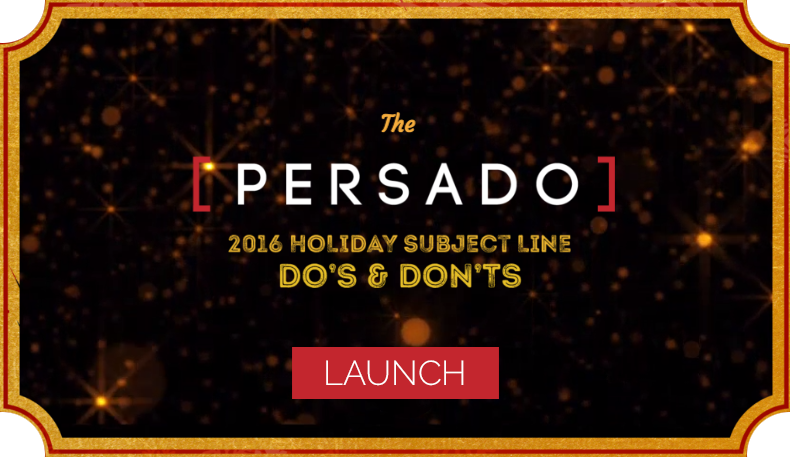 This is exactly why Persado thought it so important to create our 2016 Holiday Subject Lines Do’s & Don’ts: to offer holiday email marketing tips for this crucial three-month marketing flurry. DO: Use the actual holiday name early in the subject line. Your audience is expecting holiday emails for discounts and special offers. It must be clear that this email is special. DON’T: Use puns or holiday-specific language: ‘spook-tacular,’ ‘yule love this,’ or ‘gobble up the savings.’ Cheesy, pun-filled subject lines will actually drive people away. If your subject line can be followed by ‘get it?’, it’s the wrong subject line. Open our Holiday Guide below for the full list of DO’s & DON’Ts for holiday email subject lines.